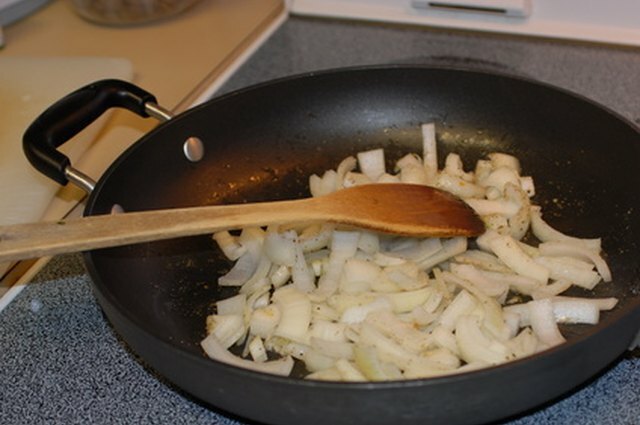 Over time, the coating on Calphalon non-stick pans can begin to deteriorate or peel away. When this occurs, cooking can be difficult in the pan. Not only can the non-stick surface potentially peel off into the food, but the surface temperature can be uneven due to the peeling surface. When the surface begins to peel, resurface the pans as quickly as possible to prevent further damage. Preheat your oven to 550 degrees. Clean the pan. Fill a sink with warm water and a squirt of liquid dish soap. Use a sponge to clean the surface of the pan. 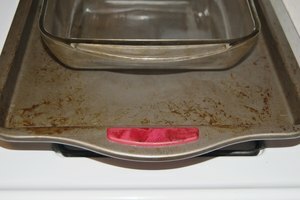 Do not use anything to wipe the surface of the pan that is abrasive as it can further damage or peel the surface. Rinse the pan in cool water to remove soap residue. Towel dry the pan. Spray the Calphalon non-stick surface with a non-stick surface repair spray. Spray the coating in an even layer over the entire cooking surface. Allow the spray to sit on the surface for 30 minutes. Place the pan in the oven preheated to 550 degrees. 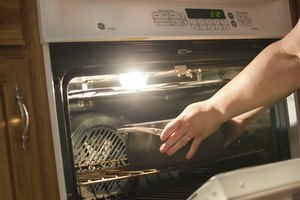 Allow the pan to stay in the oven for 30 to 45 minutes, based on the instructions of the brand of non-stick surface repair spray. Remove the pan with oven mitts. Allow it to cool before re-washing it. If desired, an additional layer of non-stick coating can be added. Good Housekeeping: Nervous About Nonstick?